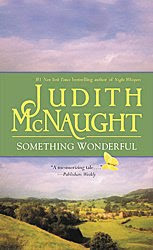 I've definitely found Judith McNaught books to be love 'em or hate 'em for me. Of the 6 (7?) I've read/tried to read, the only two that I really liked were Kingdom of Dreams and Once and Always. Both are keepers for me and frequent rereads. I read this one years ago but don't really remember much about it at all, which leads me to suspect I didn't really care for it that much. My favourite book of hers is Once and Always.